In 2015, Quesada released the limited run Keg in time for St. Patrick’s Day, packed in beer barrel shaped boxes and meant to be enjoyed with an Irish stout. This year, the company again came out with the same blend with some cosmetic packaging and band changes. Made at Plasencia Cigars S.A. in Nicaragua, the Keg comes in three sizes: Lonsdale 6 x 44 (30/keg), Toro 6 x 50 (21/keg), and Toro Gordo 6 x 60 (16/keg), with prices ranging from $5.95 to $8.95. I picked up a couple of the Toros at a Quesada event at Stogies N Hops in Lynnwood, WA last month. 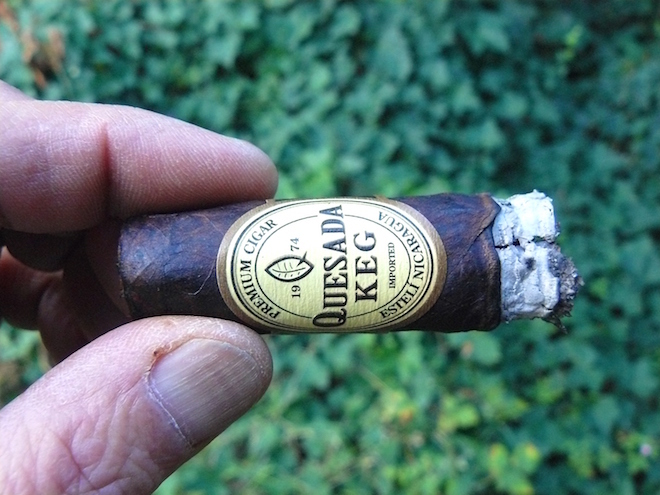 The Quesada Keg is beautifully presented in a damned near black Pennsylvania Broadleaf wrapper that is interspersed with lighter areas around the fine veining and a sandpapery toothiness. The nearly seamless roll is very firm, although not rock hard, with one small softer spot above the band. The band, in manila yellow with black and gold/bronze, looks suspiciously like a classic beer label and matches well with the darkness of the wrapper. The wrapper gives off a tart barnyard aroma, while the foot shows rich, spice laden tobacco and some woodiness. Clipping the cap reveals an ideal draw carrying sweet musky spice, light wood, and a tingle on the lips. The Quesada Keg immediately deals out a copious amount of smoke that showcases oak, earth, coffee, and spices with pepper trailing behind. The oak soon becomes toasty and the coffee becomes stronger, deepening the flavors. The sharp burn line, which had started out a little wavy, quickly self-corrected, but the ash has fallen into my lap short of an inch. 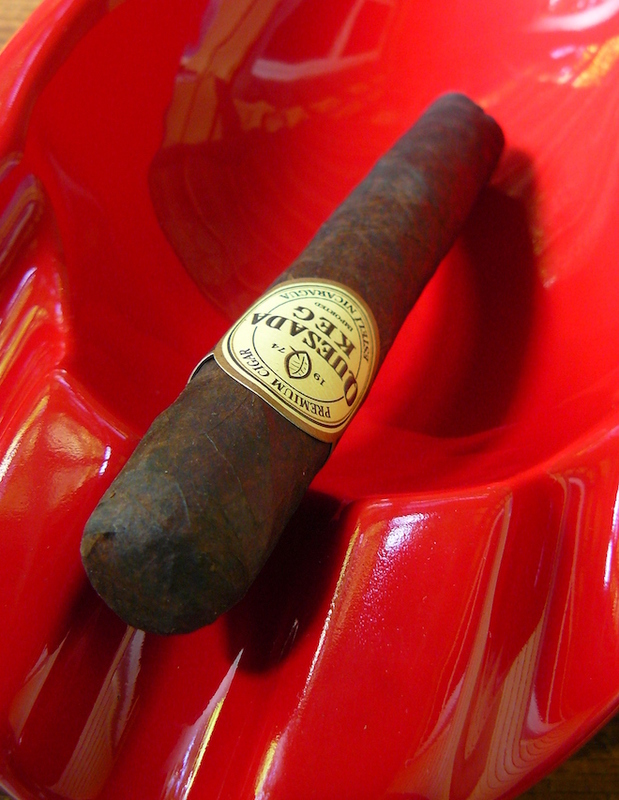 Retrohaling shows some smooth black pepper and hints of leather and musk. The initial third of the Keg winds up at medium in body. Moving into the center section of the Quesada Keg, the toasty wood, earth, and light coffee continue to lead the way, while the leather and faint musk bring up the rear. Pepper shows itself at the back of the throat and lingers on the retrohale. The mouthfeel has actually become a bit lighter and smoother, although I am beginning to feel just a bit of strength creep in. Light sweet spice notes peek in and out, and the coffee is becoming more noticeable on the back end, as both body and strength begin to climb, heading toward medium-full in body and medium strength. 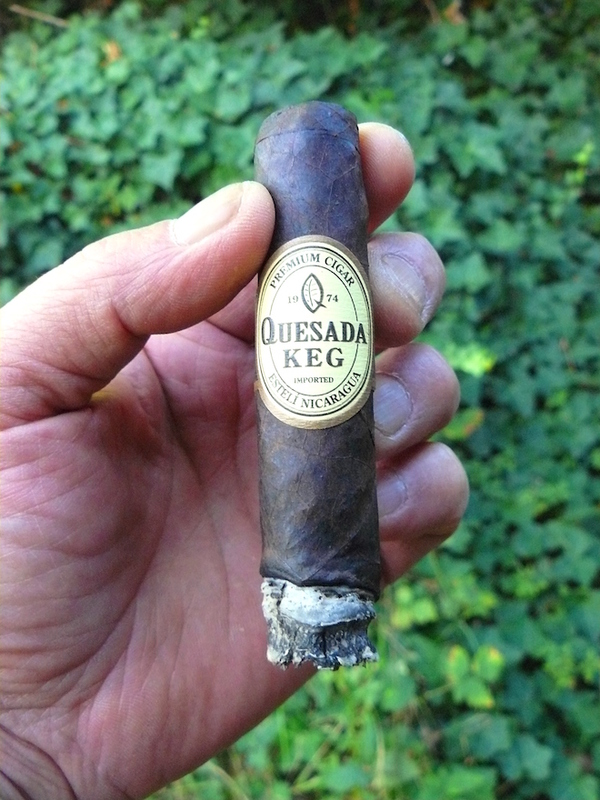 Entering the final leg of its run, the Quesada Keg continues to show the same flavor profile, but also continues to up the ante in the way of intensity. The burn has been wavering, requiring a couple of minor touch-ups, but I can’t consider that to be much of a problem. Sweetness has become a factor and the pepper has also ramped up. Taking the nearly full-bodied and medium-plus strength Keg down to the final inch, it finishes cool and without harshness, although it is a little squishy at this point. 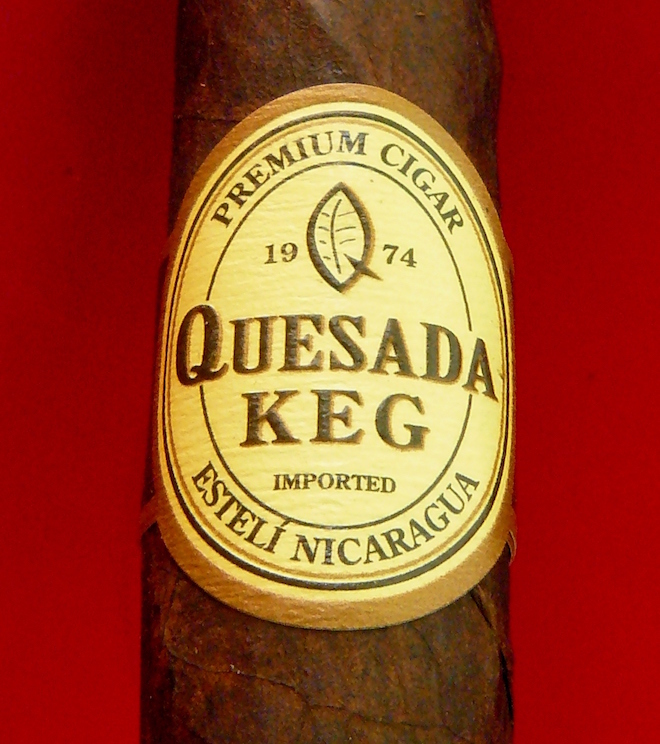 Whether you pair the Quesada Keg or not, it is very much a cigar worth grabbing if you see it. While it was not the most complex cigar around, there was certainly enough there to enjoy and the flavors mingled well and became more intense as the cigar progressed. 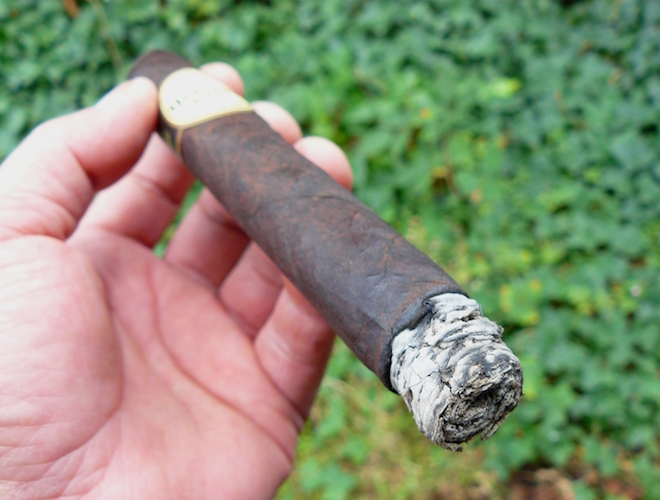 Despite needing a few touch-ups along the way, the cigar’s construction was very good and I think the price is right where it should be. I would caution, though, that this may be a cigar best smoked outside, as it pumped out a pretty prodigious amount of stationary smoke as it sat in my ashtray. No Irish stout on hand? No problem, as there are a ton of American stouts out there, and excellent ones at that. Sound Brewery’s Ursus americanus (yes the brewery does spell it with a lower case “a” in deference to the scientific name) gets its moniker from the American black bear, but it is not really a fierce predator in a bottle. Rather, it hangs out on the lighter side of the American stout spectrum with a surprisingly light feel upon entry, with flavors of prune, citrus, coffee, a wisp of smoke and a tangy finish. As with most dark beers, the flavors deepen as the beer warms in the glass, and it provided a very nice foil for the Quesada Keg, even bringing out more sweetness in the cigar, despite not being a particularly sweet stout itself. 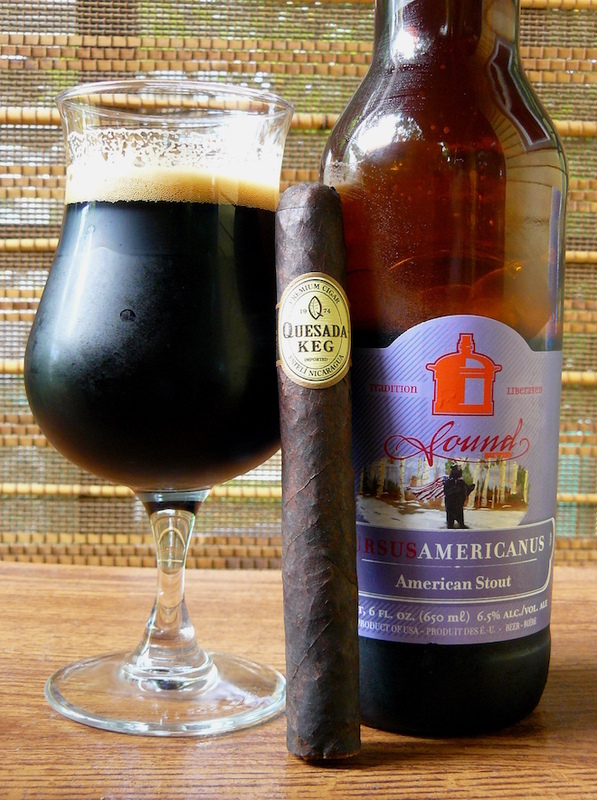 I can see how an Irish or English stout might be a better match for this cigar, though, as they tend to be less hoppy and bitter than the American versions. A good strong cup of coffee or a big tawny port would also be a great way to go with the Keg.